The charreada of today gets the feminine touch when the woman ride in the Escaramuza.The spectators applaud when see to the group carry out its beautiful and dangerous designs while riding in their gaily colored dresses on side saddles. They're mounted "to mujeriegas", that is sideways, in an albarda of European origin that is peculiar to the Charreríía but has evolved over hundred of years in both Europe and Africa. 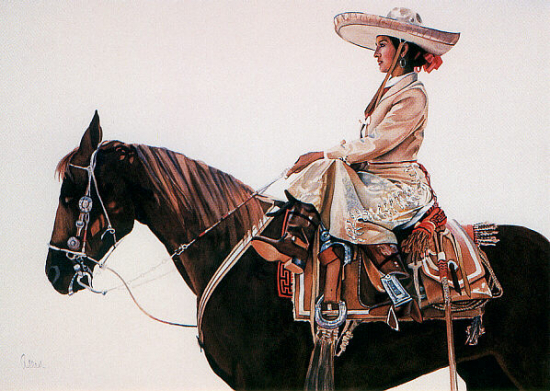 The traditional side saddle or albarda for the Escaramuza, is a cut down charro saddle, with a leather seat and leg restraints attached. A "U" shapped one for the right leg and a "C" shapped one for the left leg. 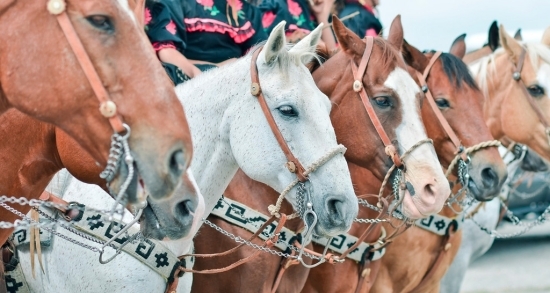 The current Escaramuza began as small groups called "Cuadrillas" that integrated into the Charreada as the "Mexican Carousel" in the 1950's where both girls and boys participated. Over the next few decades the contest between the various groups became known as the Escaramuza, or "skirmish". This came from the tradition of mounted women performing in military manner. The earliest reference to women doing precision riding was around the 1800, Henri Lang refered to a group English women known as the: "March of the Hussars". In 1843 we find the France had their own "Circle of Champs Elyséée". Not to be outdone in 1876 the Germans had the "Corty Circus" of Berlíín. In the United Staes, eight "Mexican Seññoritas" participated in the Pawnee Bill Will West Show around 1887. In 1890, Pawnee Bill presented another spectacular of Mexicans who executed a "dance number to horse" (Mexican Contradance) performed by several couples. During the Mexican Revolution Charreríía declined. The social upheaval resulted in a movement into a more urban society, that caused a subsidence in the rural heritage. After the revolution a number of states in Mexico, began to have classes in the old ranch traditions. A number of associations formed around these school and the idea of maintaining the tradition of charreada resulted in the formation of the National Federation in 1925. Originally the association was very much a male affair. Women could be involved in the ancillary acts, but were not present in the arena. By 1933, a group of wives formed the "Friends of Charros", which brought them into festivals and parades. The immediate antecedent of the present Escaramuzas, were the Adelitas, or the women of the revolution. The romantic story about their involvement in the revolution, was that they were the decoys. The women would ride off to raise a cloud of dust, so that the Federales were deceived into thinking the attack would come from that direction. The revolutionaries would then attack from the rear. The male orientation of charreada remained until the early 50's. That is when the Mexican Carousel grew out of a trip to the Houston Stock Show. At that time, a charro saw the flag ceremony at the beginning of the event and was so taken with it, that he began to have exhibitions of girls and boys performing precision ridding. After a while the boys returned to the male events and teams of girls began to compete in the Adelitas dress, and thus began the tradition of the Escaramuza Charra. I WOULD LIKE TO ACKNOWLEDGE DECHARROS.COM "HISTORIA DE LA ESCARAMUZA CHARRA, FOR MUCH OF THE INFORMATION CONTAINED HERE.